Snakes are found in almost all parts of the world, with the exception of New Zealand and Ireland, the polar regions, the Atlantic Ocean, and some very urban areas. Many species are very widespread. Pelagic Sea Snakes (Pelamis platurus) are probably found over the greatest percentage of the Earth's surface, although they are entirely marine. On land, Ring-necked Snakes (Diadophis punctatus) and Racers (Coluber constrictor) are found throughout North America, European Adders (Vipera berus) from Spain to Kamchatka and above the Arctic Circle, Grass Snakes (Natrix natrix) from Great Britian to Mongolia, and Gaboon Vipers (Bitis gabonica) from Africa's Gold Coast to its Great Rift Valley. However, the title of "most widespread snake in the world" goes to the tiny Brahminy Blindsnake (Ramphotyphlops braminus), named after Hinduism's Brahmin caste. Brahminy Blindsnakes are found on nearly every continent and on countless islands, mostly in the tropics. They are so successful at least in part because they are the only unisexual species of snake. There are no male Brahminy Blindsnakes. There never have been and there never will be. Instead, each female lays about 4 rice-grain-sized eggs a year, which hatch into sewing-needle-sized daughters identical to each other and to their mother. If that doesn't sound very fecund, it's because it isn't - it doesn't have to be! In spite of their low reproductive output, Brahminy Blindsnakes have spread over most of the world, because just a single individual is capable of founding a new population. In fact, we don't even really know where the original native range of the Brahminy Blindsnake was. It is most common in southern Asia, where it was first discovered in 1796, so it's likely that it originated somewhere around there, but it's difficult to say for sure. Usually, biologists can exploit differences in the genetics or morphology of a widespread species to figure out where it came from. Attempts to uncover the geographic origin of Brahminy Blindsnakes have been unsuccessful because all Brahminy Blindsnakes are clones of one another, so there is almost no variation to analyze! How did this species evolve? The leading theory for most unisexual species of reptiles, amphibians, and fishes involves a hybrid origin, where two or more "parent" species contribute genes. In most unisexual amphibians and fishes, sperm from a male (often of one of the parent species, but sometimes any sperm will do) is required to initiate development of the eggs but does not contribute genetic material. This is not the case for lizards or for the Brahminy Blindsnake, which are truly parthenogenetic. Which were the parent species of the Brahminy Blindsnake? We don't know. Of the 400-odd blindsnake species, the Brahminy Blindsnake is probably one of the best known due to its wide distribution and peculiar reproductive habits. Some recent phylogenies have shown that it is closely related to the South Indian Blindsnake (Typhlops pammeces), and others to an undescribed species of Sri Lankan blindsnake, both consistent with the hypothesis that south Asia is the species' center of origin. One very recent analysis suggested reclassifying all three species into a new genus, Indotyphlops. Because up to a quarter of all blindsnake species are still undescribed, it's possible that the parent species are as-yet unknown to science. 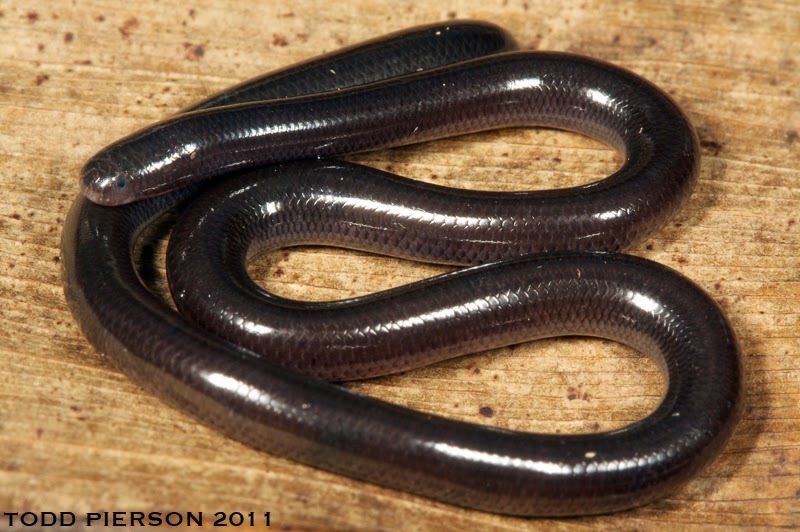 These days Brahminy Blindsnakes mostly get around through the horticulture trade, although in the past they may have hitchhiked along with Pacific Islanders. Snakes are generally good dispersers, with the ability to go without food for long periods of time and squeeze into tight spaces, which might help explain why they have successfully colonized most of the world. Of all the fantastic voyages Brahminy Blindsnakes must have undergone, one of the most amazing is that documented by herpetologist and TV personality Mark O'Shea in East Timor. He and his team found a live Brahminy Blindsnake coming out of the back end of a toad, demonstrating the snakes' resilience to even the most caustic of environments. Most of the time, an introduced species has about a 50/50 chance of successfully establishing itself in a new environment. 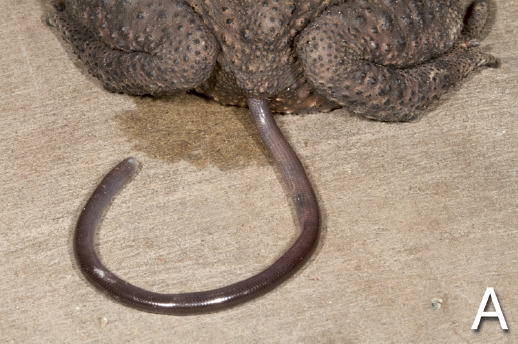 Given how widespread Brahminy Blindsnakes are and their infamy as invaders, you might ask whether an introduced population of Brahminy Blindsnakes has ever failed to become established? A comprehensive database of reptile introductions includes only two such instances, one in southern Arizona and one in New Zealand. In Arizona, a population has subsequently become established despite the arid climate, but New Zealand is probably too cold for blindsnakes, and they take introduced species very seriously there. 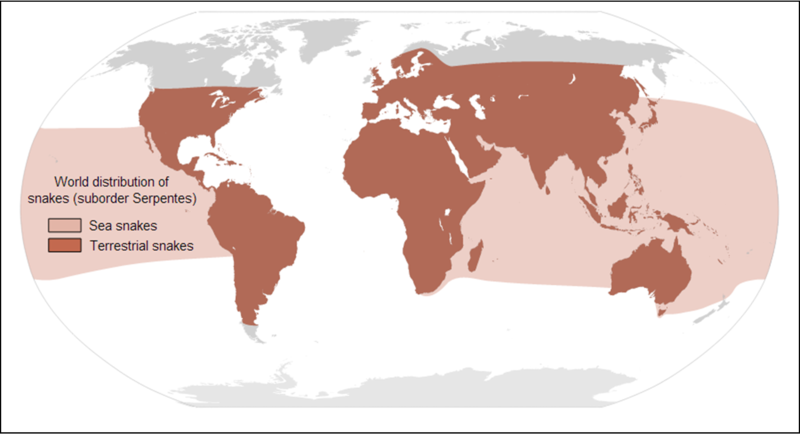 Nevertheless, the Brahminy Blindsnake will probably continue to spread, at least throughout the tropical regions of the world. The literature is full of first reports of this species, so much so that at least one was reported twice! Amazingly, both specimens were bicycle casualties collected in the same suburb of Cairo, leading the second author to title his article "How many times can a flower-pot snake be run over for the first time?" 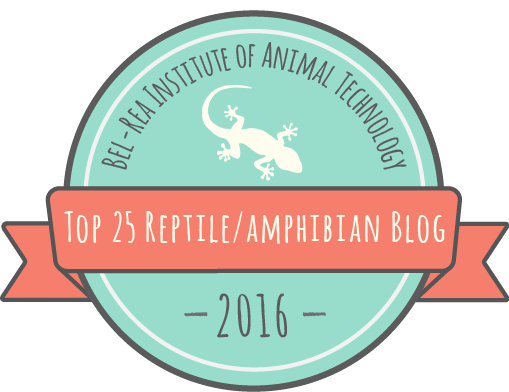 Click here to read more about blindsnakes and their unique relationship with certain owls, or here for a refresher on their place in snake taxonomy! Thanks to Todd Pierson for his photograph and to Phil Rosen, Jeff Servoss, Don Swann, Michael Lau, and Skip Lazell for bringing me up to date on the latest in blindsnake biology. Baha el Din, S. M. 2001. On the first report of Ramphotyphlops braminus from Egypt: how many times can a flower-pot snake be run over for the first time? Herpetological Review 32:11. Kamosawa, M. and H. Ota. 1996. Reproductive biology of the brahminy blind snake (Ramphotyphlops braminus) from the Ryukyu archipelago, Japan. Journal of Herpetology 30:9-14. Ota, H., T. Hikida, M. Matsui, A. Mori, and A. H. Wynn. 1991. Morphological variation, karyotype and reproduction of the parthenogenetic blind snake, Ramphotyphlops braminus, from the insular region of East Asia and Saipan. Amphibia-Reptilia 12:181-193.